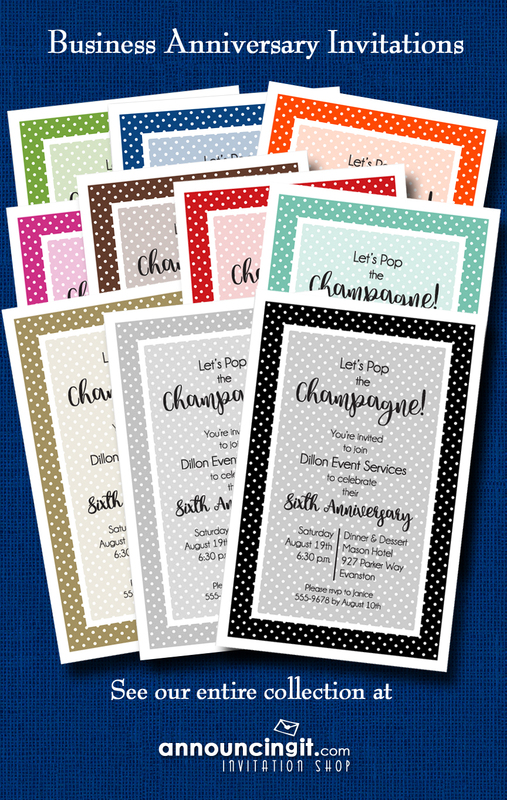 White polka dots on colorful backgrounds, these party invitations are perfect for business invitations, business anniversary invitations, business cocktail party invitations or any corporate occasion. Use our wording or change it to fit your own occasion for birthday parties and more. Available in your choice of white dots on Green, Blue, Orange, Hot Pink, Brown, Red, Turquoise, Purple, Gold, Silver or Black. This entry was posted on Tuesday, June 12th, 2018 at 4:25 pm	and is filed under Adult Invitations, Business, General Info, Invitations. You can follow any responses to this entry through the RSS 2.0 feed. You can skip to the end and leave a response. Pinging is currently not allowed.